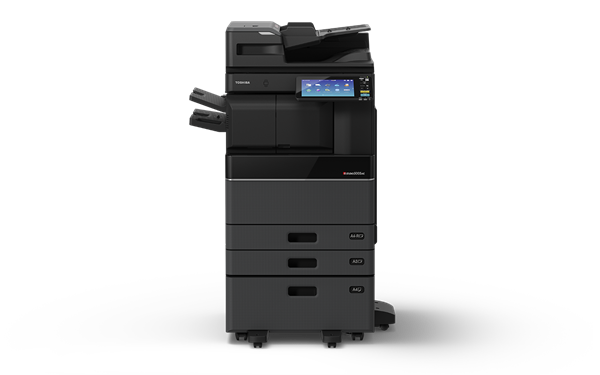 The Toshiba e-STUDIO2515AC multifunction colour printers comes with copy, print, and scanning capabilities. 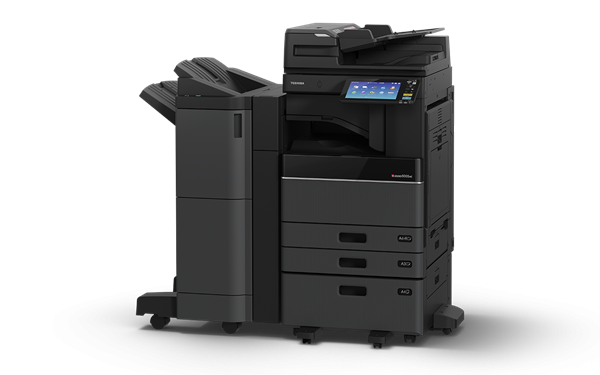 It is a perfect addition to your office and your employees will appreciate its incredible outspeeds: (25 cpm) in colour and black and first copy times in under 7.8 sec (colour) and 5.9 sec (black). The MFP will easily keep your offices productive and ensure deadlines are met. 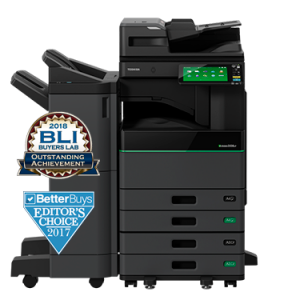 It also does more than print quickly – this multifunction printer will impress your clients with vibrant colours and vivid text thanks to exceptional laser quality and 1200 x 1200 dpi print resolution. 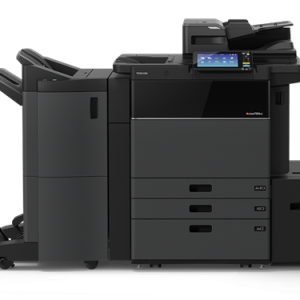 The e-STUDIO 2515AC features a black high yield toner catridge that delivers an estimated 38,4000 pages. The colour toner catridges: cyan, magenta and yellow deliver aproximately 33,600 pages with an average of 5% page coverage. 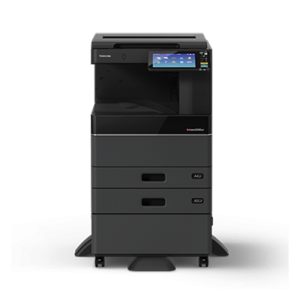 Small to large workgroups can use the Toshiba e-STUDIO2515AC paper handling capabilities to do more, faster. Paper capacities can range from 1,200 pages up to 3,200 pages. Paper sources are easily adjusted to accommodate paper sizes ranging from 4” x 6” up to 12” x 18” as well as process envelopes and specialized media. The e-STUDIO2515AC can create 11” x 17” colour bleed prints on 12” x 18” paper. The limitless job reservation capability on the e-STUDIO2515AC allows users to view multiple jobs and process the one that is more critical first. 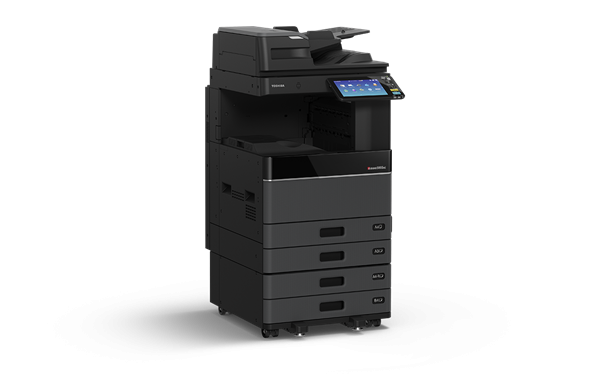 Dual-Scan Document Feeder holds an amazing 300 originals and boasts an impressive 240 images per minute (IPM) by scanning both sides of the page in a single pass. 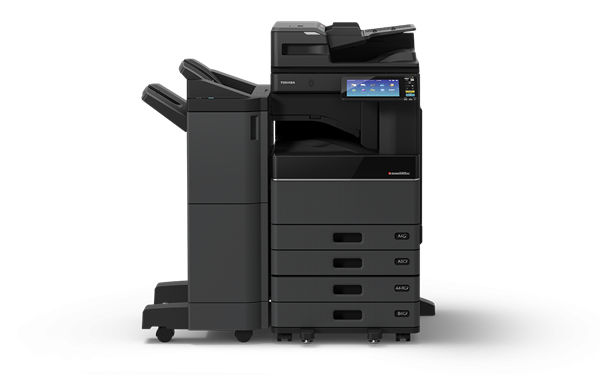 Multi-Station Print Enabler allows you to retrieve your print job from a series of networked MFPs via simple authentication. 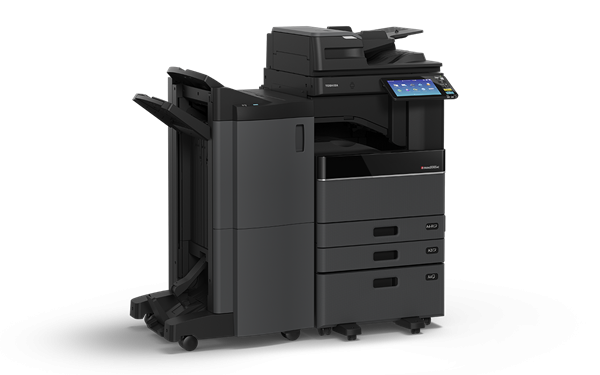 Print Around eliminates printing bottlenecks by allowing other print jobs to go around one job that’s held-up due to requiring a specific paper size or type or, in some cases, even coloured toner. Embedded Optical Character Recognition (OCR) simplifies the creation of searchable PDFs or editable document formats such as Microsoft Word®. Exclusive AquaAceMedia water and tear resistant media up to 12” x 47” banner size. Saddle/Fold Capabilities offer saddle-stitch finishing and the option to fold without stapling. 12” x 18” Cassette provides the ability to print stunning 11” x 17” colour bleeds on 12” x 18” paper. Context-Sensitive Help Button provides instant, thorough explanations straight from the manual to help as needed. Service Module Design significantly reduces the cost and time spent servicing the MFP.